Posting after quite some time! 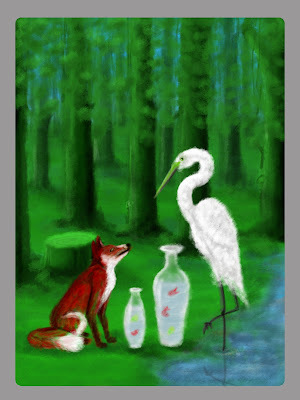 This one is from the story of the Fox and the Crane, in which, the Fox invites the Crane over for lunch and serves him food in a flat dish. The Crane, because of his long beak, is unable to enjoy his meal. So he decides to teach the Fox, a lesson.